Oh, holiday episodes. They really do get a lot of pressure put on them, don’t they? I mean, everyone’s always hoping that the holiday episodes of their favourite TV shows will be so fantastic that next year, they’ll watch them again in December alongside their annual viewings of How the Grinch Stole Christmas or Miracle on 34th Street. And because of this pressure, our favourite TV shows often end up somewhat overdosing on the holiday spirit, favouring endless holiday song after endless holiday song instead of spending time on any viable plot lines…oh, wait, maybe now I’m just talking about Glee. But since that’s what I’m supposed to be talking about anyway, let’s get straight to it. I love a good holiday movie/special/TV episode, but, for the most part, “Extraordinary Merry Christmas” really didn’t work for me. Some of the songs were great (“Let It Snow” and “All I Want for Christmas Is You”, in particular), and I actually really enjoyed the hilarious campy-ness of the black-and-white Christmas special (except that it went on entirely too long, especially “My Favourite Things”)…but the parts set in the real world were almost wholly unlikeable in my mind. The plot contrivance that the TV special was being filmed on the same day that the glee club was supposed to sing for the homeless was silly, Sam’s new role of a spirit guide for Rory was quite sudden and strange, and Rachel, for some reason, turned into way more of a selfish diva than ever before…oh, and also, the show seems to have also forgotten that she’s Jewish. But more on all of that (and more!) later. For now, let’s break this episode down piece by piece, shall we? Favourite Character(s): I’m not sure any character particularly stuck out for me in this episode, but I did love seeing Artie in the director’s chair again, and I’m really pleased that Glee has effectively continued that character development straight from season 1 when he helped with Rachel’s “Run Joey Run” music video. I really hope that Artie applies for film school next year, when they once again deal with post-grad options for next year’s batch of seniors. 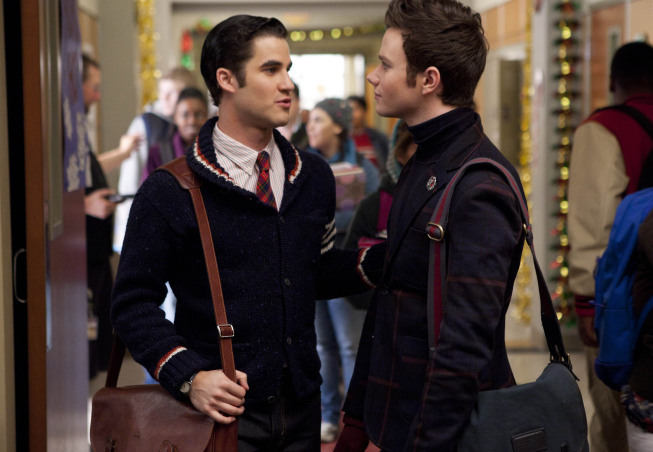 Also on my favourites list this week are Kurt and Blaine, who I thought did an excellent job as hosts of the TV special. Favourite Song: One of my complaints about this episode was that they constantly eschewed logical plot developments in favour of packing in more and more songs. This was an incredibly heavy musical episode, and I only really loved a few of them, unfortunately. Mercedes was fantastic on the opening “All I Want for Christmas Is You” number, and Kurt and Blaine were super adorable in “Let It Snow”. I enjoyed Rachel’s version of “River”, but it was a bit boring to watch. And let’s, for a moment, talk about the appropriateness of “Do They Know It’s Christmas” being sung at a homeless shelter. Yikes, Glee. This is one of my all-time favourite holiday songs, but the line “Tonight thank god it’s them instead of you” as always rubbed me entirely the wrong way, and actually singing that directly to the children at a homeless shelter? Terribly inappropriate and offensive, in my opinion. Sue’s Corner: Even though she only had a few short scenes (after being completely absent last week), Sue was quite the spotlight stealer for me. The scene in her office with Artie, Kurt and Blaine was full of comic gold (particularly calling Blaine a “Young Burt Reynolds”! 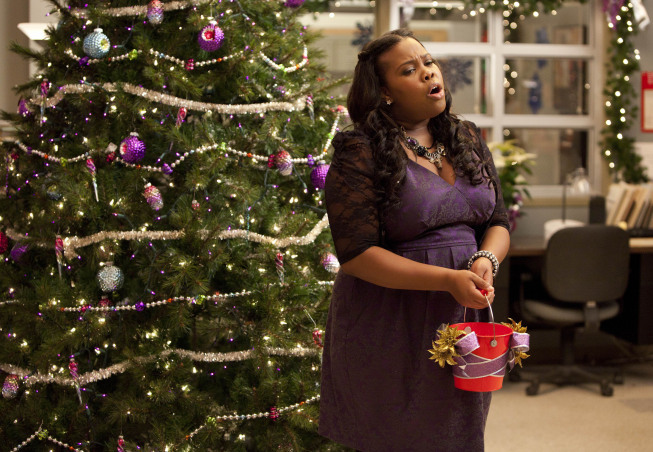 ), and I loved watching her during the “Do They Know It’s Christmas” performance. So lovely and heartwarming. Sue (to Artie, Kurt and Blaine): Everyone knows that Christmas is a time for forgiveness, so I have decided to forgive you for having no talent and ruining the American songbook one mash-up at a time. Sue: I made plans to shoot reindeer from my helicopter with Sarah Palin, but she canceled. Apparently Todd gets fussy when she misses his ballet recitals. Kurt: This is my, um, best friend and holiday roommate, Blaine Anderson. Blaine: Why, they’re candy cane-striped capri pants! And you know what the best part is? I actually don’t already own a pair, if you can believe that. The Christmas Special: It was campy, it was ridiculous, and it was way too long…but still, my favourite part of the episode was the black-and-white PBS Christmas special. I do wish that it had been somewhat shorter, but I thought that all of the characters involved were incredibly charming and funny, particularly Kurt, Blaine, Rachel and Mercedes. The inclusion of Finn as Luke Skywalker and Puck as Han Solo was also a cute way to work in Artie’s Star Wars love. Overall, I thought this was a really fun tribute to the Christmas specials of the past. Weak Point: In addition to some of the points I’ve made above about there being too many songs in this week’s episode, one of which was terribly inappropriate, I also had a huge issue with Rachel’s characterization. Despite all of her shortcomings (and believe me, I know she has quite a few), Rachel is one of my favourite characters on the show. I know she can be selfish and incredibly diva-esque, but I really felt that the writers insanely over-demonized her this week. She was so terrible in her demanding of bling from Finn, that he even referred to her as Kim Kardashian. And while in this episode, I can’t actually blame him for nicknaming her as such, I really don’t think that I would’ve let him get away with such a reference prior to now. One thing we’ve never seen Rachel being is terribly materialistic, and it made me incredibly angry to see her characterized this way for this episode. And, on top of that, she was being materialistic in wanting not a Hanukkah present, but a Christmas present! The entire episode completely ignored Rachel’s Judaism (and Puck’s, for that matter), with maybe the exception of Rachel saying “Happy Hanukkah!” at the very end of the episode when ringing the Salvation Army bells with Finn, Sam and Rory. But to be honest, I really don’t even think that counts. Next, next, next, next, next week (January 17): Glee’s back in January with lots of big announcements – Will’s proposing to Emma, Finn’s meeting with a recruiter for the army, and Sam’s joining the synchronized swim team! Check out the preview now – and then go share your thoughts on this week’s episode and the next one…in the comments! Suzie, I totally agree with your assessment of the last episode. I felt like they spent too much time trying to sell their holiday album to actually focus on a coherent story line. And the part about them totally ignoring that Rachel (and puck) are Jewish was driving me crazy too! So far this season has been a mess and I really feel like the show is loosing it’s way! Yes, that’s exactly it – it seemed too much like a promotional episode for the holiday album, in a way that was much more obvious than it was with last year’s holiday episode and album. I don’t think the whole season has been a mess so far (I thought the Sectionals episode was really great!) but this one really disappointed me, and I hope the show’s back in better shape come January. Thanks so much for commenting! I so totally wished that they could have closed the black and white earlier!